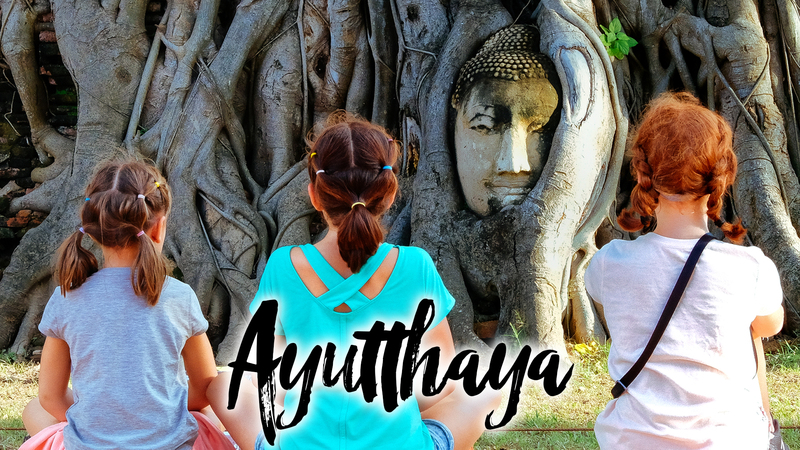 In this episode of our family travel vlog, we head up to the edge of Thailand to Chiang Rai and the Golden Triangle with the kids! It was only an overnight trip, but man did we pack a ton in. Karen Long-Neck Villages, Monkey Temples, Black House, Blue and White Temples, plus more. I’m not even sure how we were able to squeeze everything in, but it was so worth it, check it out. We were picked up from our AirBnB by our driver for the next two days. Our first stop on the way up to The Golden Triangle was a natural hot springs, which quite frankly was just to hot for us, but it worked out as a great bathroom break. After the hot springs, we headed up to a Karen Long Neck Village. The girls had a blast spending time with the little girls in the tribe. It’s always amazing to us how kids will be kids, no matter what their background. Our final stop of the day before getting to the Golden Triangle was a Monkey Temple/Cave. This was not your typical Monkey Temple. These suckers were really aggressive. It should have been more obvious to us when we walked through the gates and they handed each of us a “monkey beating” stick, what we were getting into to. It was a pretty exciting time, and we were only attacked once…poor Paige. The last stop of the day was the Golden Triangle, where the Mekong and the Ruak River come together and you can see Laos and Myanmar while standing in Thailand. After a few photos, we headed out to dinner in Chiang Rai and had the opportunity to watch the clock tower downtown put on its light show. We woke up fairly early the next day, had a decent breakfast and headed to our first stop The Black House. The Black House, aka Baan Dam Museum, was originally the home of Thawan Duchanee, a famous Thai contemporary artist, it now houses much of his work, plus other artists work. It is a very interesting stop and certainly not what we were expecting. The Blue Temple was next…and guess what? It was very blue. The contrast of the dark blue and gold was really striking and was one of the more unique temples that we’ve seen in our travels. A Chinese Temple was next, which consisted of a huge white statue. The temple was so big it felt like we were the only one there. Next up is our final video in Chiang Mai and then we’re off to Bali!